here, with my thoughts on this impending disaster included in the story. My "esprit de l'escalier" moment: re-branding in fact can work, but there must be something of substance on offer once you get past the packaging. Anchor Peter Mansbridge (for whom I have respect as a journalist) is quoted as saying it has to be this way: "I get it. It's television." Does this mean that for television to be successful, it must downplay substance and context? 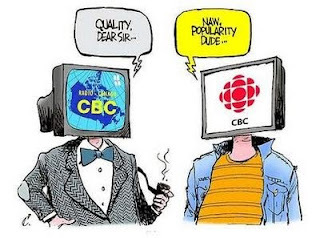 I don't think so when I watch CBC TV's "The Fifth Estate" or PBS' "Frontline." If McLuhan was right when he said, "the media is the message," in the case of the re-branding National News, the message has been garbled in transmission. McLuhan was familiar enough with Latin to have said 'the medium is the message', as he would have recognized 'media' as a plural.